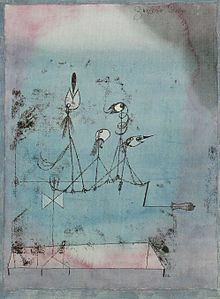 Painters and Poets: Paul Klee "On Modern Art"
"In the womb of nature, at the source of creation, where the secret key to all lies guarded. But not all can enter. each should follow where the pulse of his own heart leads. So, in their time, the Impressionists - our opposites of yesterday - had every right to dwell within the matted undergrowth of every-day vision. But our pounding heart drives us down, deep down to the source of all. What springs from this source, whatever it be called, dreams or idea or fantasy - must be taken seriously only if it unites with the proper creative means to form a work of art."